Rebirthing breathwork is an amazing tool for cleaning and re energising our body on a daily basis. Once we connect the breath and surrender, the breath forms its own rhythm clearing deeply seated suppressed emotions. 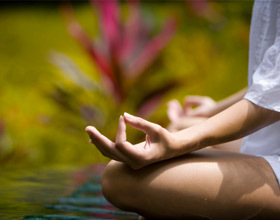 Physical, emotional, and psychological healing is enhanced by infusing the body with breath/prana/chi/ life-force. A deep inner purification takes place to restore balance to mind, body and spirit. It allows you to be more fully present in your body, creating higher levels of conscious awareness, increased health and vitality and an overall sense of well being. “This technique is perhaps the most valuable self-healing ability that humans can learn. We can not have disease and relaxation in the same space at the same time. Relaxation is the ultimate healer. Every breath induces relaxation. Therefore, breathing is the basic healer. Conscious Energy Breathing is the most natural healing ability of all. This ability involves merging the inhale with the exhale in a gentle relaxed rhythm in an intuitive way that floods the body with life enhancing Energy. This therapy is included as 2 hours into the 4 Night Retreat Programme.